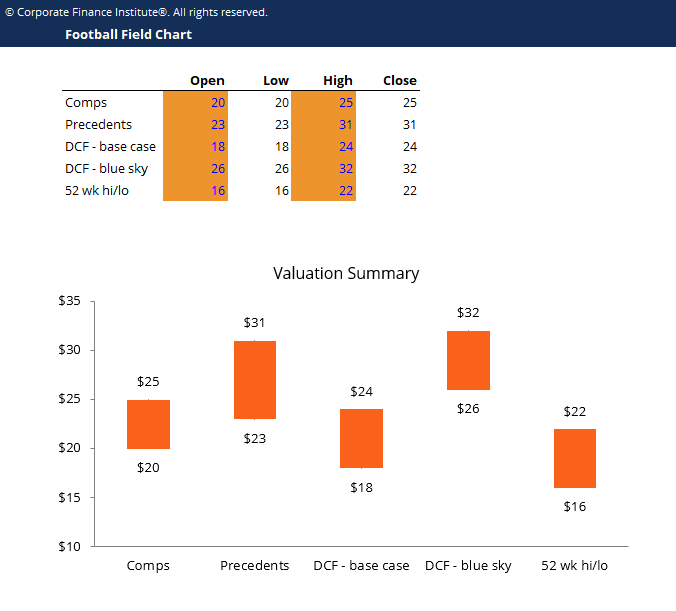 This football field chart template can be used to summarize a range of values for a business, based on different valuation methodsValuation MethodsWhen valuing a company as a going concern there are three main valuation methods used: DCF analysis, comparable companies, and precedent transactions. These methods of valuation are used in investment banking, equity research, private equity, corporate development, mergers & acquisitions, leveraged buyouts and finance. The purpose of the football field chart is to show how much someone might be willing to pay for a business, whether acquiring all of it, part of it, or even a single share (depending on the audience). Why is it called a football field? The bars look like yard lines on a football field, and hence the name. Also, the graph is commonly used in investment banking, and bankers like sports analogies. Why use a football field chart? The reason it’s used is to visually show what the range of values for a business are and see where, an average, a target valuation lies compared to several alternatives. It’s common to see these charts in an investment banking pitch bookInvestment Pitch Deck TemplateThis free pitch deck template is based on hundreds of investor presentations I've seen. Download the free template to build your investor pitch deck. This PPT template can be used to create your own pitch for raising capital or present to investors to tell your story. or equity research report.